Fig. 11-%. Equivalent Axial Load. 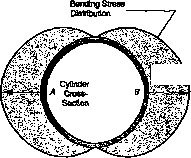 The cylinder at the left can be exposed to axial (P), shear (V), or bending loads (M). Note that a bending moment at the base of the cylinder could be created either by the applied tending moment, M, or the lateral load, V, applied somewhere above the base (lateral load times moment arm). Pressure vessels are composed of doubly-curved shells such as spheres or ellipsoids. See Fig. 11-37. By doubly-curved, we mean that the surface geometry can be defined when two radii of curvature are known. Typical names for these radii are the longitudinal or meridional radius of curvature, designated R„, and the circumferential or hoop radius of curvature, Rk, In all cases, these radii are measured perpendicular to the shell, not the central axis of symmetry. Figure 11-38 illustrates this double curvature. Fig. 11-37. 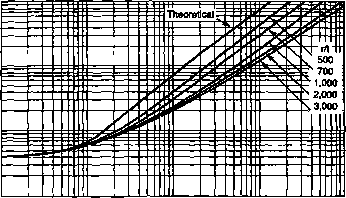 Characteristics of Doubly-Curved Shells, In each case, the horizontal line is the longitudinal axis of symmetry. a where y is a reduction factor used to correlate theory to test results. Thin-shell buckling is very sensitive to minor imperfections in shape, so yean be as low as 0.15 if the thin shell is badly dented. 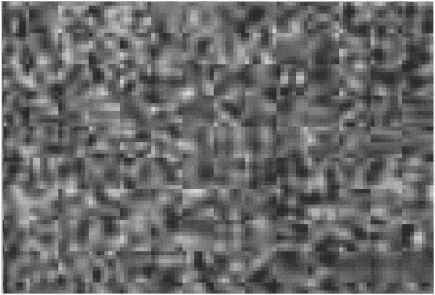 The reduction factor depends on a geometric parameter, <p, for cylinders. Note the caveats for Eq. (11-53), where R is the radius, t is thickness, and L is the length of the shell. If a^ is greater than the material's proportional limit, we must apply other inelastic buckling methods [NASA, 1975]. Fig. 11-38. 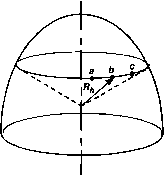 Radii of Curvature for Doubly-Curved Shells. 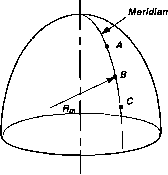 Together, the meridional and hoop radii of curvature fully describe the geometry of a doubly curved shell.